When city life gets too hectic, you have to escape to somewhere where the energy is chill but, let’s be honest, there’s also still amazing food and shopping. 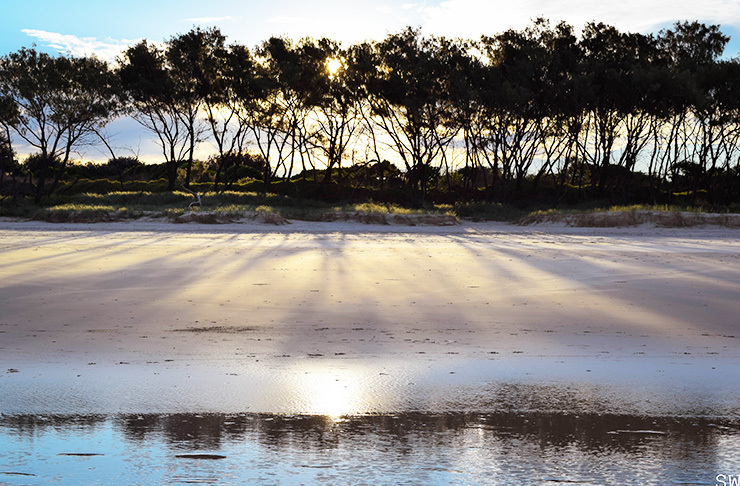 Enter Byron Bay. The famous beach town boasts great beaches, stunning boutique hotels and awesome food, but also has the bonus of a strong hippie vibe that forces you to chill the eff out. The most important thing for a luxe gals trip is to find an amazing place to stay. 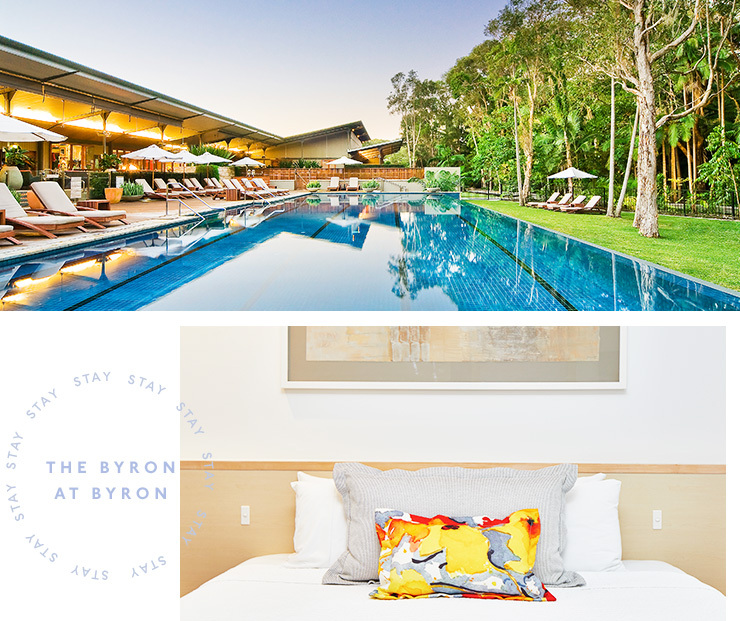 We went with the stunning The Byron at Byron Resort. Set a little way from town, the beautiful accommodation backs on to a private beach, offers amazing food, not to mention the site was selected for its great energy. Yes, that’s totally Byron, but when you’re there you’ll see it’s totally true. Ahhhh. If you’re looking for something a little closer to town though, check out the cute interiors at The Atlantic or the peaceful zen of Paperbark. Feeling full we take a stroll into town for some shopping time. We avoid the crowds on the main street and hit up the boutiques on Marvell Street. Wallets are opened more than a few times for the gorgeous homewares at AHOY. We start the day with the most important thing, eating! We head to The Top Shop on top of the hill on Carlyle Street. 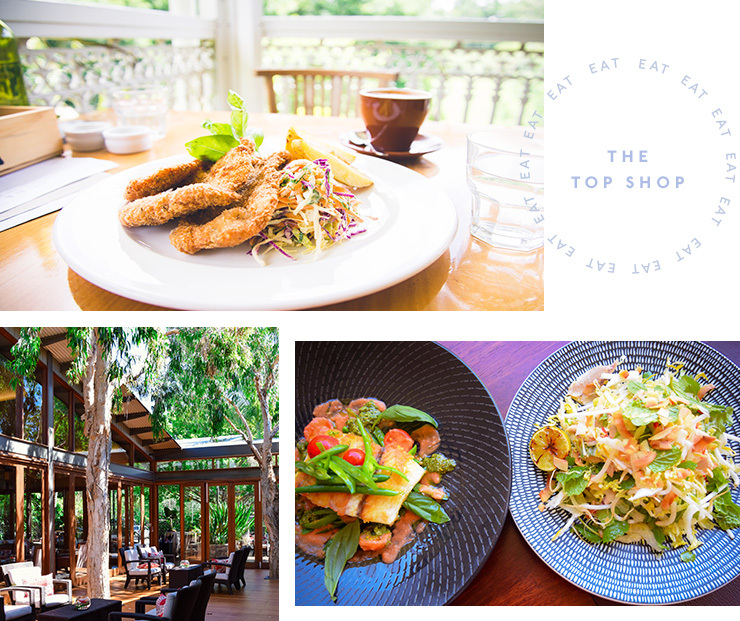 It’s a local favourite with good coffee and lots of healthy breakky options and has the added bonus of all the cute local surfers hanging out on the front lawn. Other local favourites include Bayleaf and Folk (a little way from the town centre, in a Caravan Park, but trust us, it’s cool). The best thing about Byron is that you can basically walk from breakfast to shopping to the beach. We set up our towels for sunbaking and watch British tourists burn themselves while we slather on SPF 50. And what is it about the beach that whips up an appetite? Ice creams are obviously now required for sustenance. Newly opened ice cream joint Beaches and Cream is conveniently on the beach (just FYI, they also do a sweet trade in doughnuts). Back at the Byron at Byron we break into two camps. Those of us who want to get pampered and those of us who find that a little too much effort. Yes, we’re very aware that this is first world problems moment on steroids. Relaxing by the pool in the lounge chairs is the perfect combination of enjoyment and zero effort. It’s officially cocktail time. We head to St Elmo’s Dining Room & Bar on Fletcher Street where it’s espresso martinis all around. The bartenders are so friendly and attentive we get sidetracked and next thing you know we’re staying for dinner. Luckily the menu is damn delicious and includes excellent tapas. Coffee is needed. Those St Elmo’s martinis were epic. On a tip, we head to the beautiful blue and white interiors of Beach Byron. Overlooking the surf and sand of Clarke’s Beach we get caffeine all around and indulge in the breakfast spaghetti. #YOLO. No trip to the Bay is complete without a trek up to the Lighthouse. We take the beach route and it’s absolutely stunning. The stairs are pretty steep, but the breathtaking view and the fact we want to work off the breakfast pasta means it’s a win-win. This is the easternmost point of Australia and at this time of year you can see whales breach as they migrate along the coast. It’s incredible. We fully intend to hit up the markets with local designers, organic beauty and fresh produce, but we find out that they rotate each Sunday between Bangalow, Byron, Mullumbimby and Kingscliff and we’re out of luck this week. No matter, we head to awesome café Roadhouse to get a fill of fish tacos with chilli and lime. We discuss a universal truth, why the hell does time go by so fast on fun weekends but super slowly during the work week? Feeling super relaxed and awesome we pack up and prepare to say bye to the legends at the The Byron at Byron Resort. It’s a little known secret that they actually have an excellent bar, so we decide to sneak in a last cocktail to prolong the chill feeling before it’s back to grim reality. Cheers to a fabulous girls weekend!